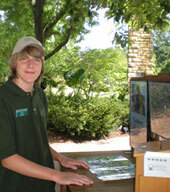 Friendly, energetic volunteers welcome visitors to Olbrich. These ambassadors answer questions about what's happening at Olbrich, accept money for Conservatory admissions and other sales, and explain Olbrich's history, mission, and membership details. Smiles, communication skills, dependability, and a desire to heighten our visitors' experiences are the only requirements. Volunteer greeter shifts are scheduled daily from 9 a.m. to 12:30 p.m. and 12:30 to 4 p.m. Greeters work two or more shifts monthly. 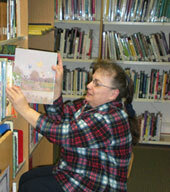 The Schumacher Library is an outstanding horticultural library specializing in resources appropriate for our region. Volunteers work with our Horticulture Librarian to help answer plant questions from visitors and help patrons use library resources. Training is provided. A desire to provide quality plant information and computer skills are required. Shifts are scheduled daily from 10 a.m. to 1 p.m. or 1 to 4 p.m.
Everyone who comes to Olbrich Botanical Gardens passes through the Growing Gifts Shop as they enter and exit. It's a very busy place that is full of must-have merchandise. Part-time staff members work with the help of volunteers to assist customers in the gift shop, operate the cash register, and help with restocking, unpacking, and marking new items. Beware: volunteers are some of the shop's best customers! The Growing Gifts Shop is open Monday through Sunday from 10 a.m. to 4 p.m.
Have you ever wondered how the staff manages to get the Conservatory ready for visitors by 10 a.m. each morning? It couldn't be done without the help of volunteers who assist the staff from 7:30 to 9 a.m. by picking up leaf litter, feeding animals, sweeping, and generally helping to clean the Conservatory. Volunteers work two shifts each month. It's all about the visitors! Conservatory volunteers provide a pleasurable and educational experience for the Bolz Conservatory visitors by sharing information about the tropical plant and animal collections. All new volunteers start as Conservatory Greeters. Those who chose to 1) learn more about the plant collection and tropical environment, and 2) develop higher level interpretation skills, advance to become Conservatory Docents. Introductory training is offered 6 times throughout the year; ongoing in-service training is provided monthly. Volunteer shifts are from 10 a.m. to 1 p.m. and 1 to 4 p.m. on weekends. Throughout the year Olbrich sponsors dozens of lectures, workshops, walks in the Gardens, and children's classes. Volunteers serve as program hosts and assist with set-up, registration, and logistics. 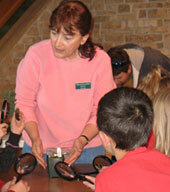 Youth and family education programs are a great opportunity for children to learn about plants. From toddlers to teens, for families or school groups, classes and programs are organized by age and include age appropriate hands-on learning activities designed to engage a child's natural curiosity. For each class or program, volunteers are needed to assist with interactive learning activities, greet and register participants, and help with class set-up and clean-up. Olbrich Botanical Gardens depends on the talents of many community members who commit to helping the gardens through fundraising, Olbrich Botanical Society Board participation, outreach to the community, and management of entire segments of events or activities. 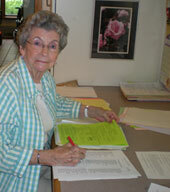 Volunteers with clerical skills help staff as needed in our offices. Volunteers help fold, stuff, and label mailings, answer phones, compile membership renewal mailings, and help with other important tasks that are required to keep our operations, events, and gardens running smoothly. To promote an understanding and appreciation of plants, the Explorer Program offers an exciting and meaningful educational experience for grade-school students (Kindergarten-3rd grade) using living plant collections and hands-on activities. The Explorer Program begins in the Atrium with a large group introduction. The group is then split in half. One group stays in the Atrium for hands-on activities at stations while the other group is led on a tour of the Bolz Conservatory or the outdoor gardens. After 30 minutes, the groups switch and the station activities and the tour are repeated. Volunteers partner with staff to provide a high-quality learning experience. The Explorer program is offered to school groups in February, April, May, October, and November. Training is provided. Garden Greeters are stationed in the outdoor gardens on weekend, June through September, to welcome and orient visitors. Their job is all about offering a healthy dose of Midwest hospitality. No plant expertise is required. Training offered in spring. Volunteers work two 3-hour shifts monthly. Do you have an interest in sharing your love of gardens with others? Garden docents provide a pleasurable and enjoyable educational experience for visitors in Olbrich's Thai Garden and Herb Garden. Docents share the history of Olbrich Botanical Gardens, information about the design of the gardens, and basic plant information. In the Thai Garden, docents also share information about the Thai sala and cultural interpretations of the garden elements. An intensive docent training is provided in spring. Volunteers host visitors in the garden Friday through Sunday, from June through October. Shifts are 10 a.m. - 1 p.m. and 1 p.m. to 4 p.m.
Join the horticulture staff on Tuesdays, Wednesdays, or Thursdays for a weekly shift to pull weeds, mulch, prune, plant, deadhead - all the fun things that keeps the gardens growing and beautiful. Volunteers must be able to handle light physical activity, including bending, lifting, kneeling, and tolerate some weather fluctuations. Volunteers must commit to a weekly crew from 8 to 11 a.m. from April through October. "Spring only" crew members work from April through June. 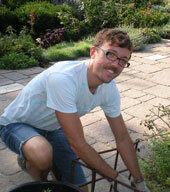 Volunteer tour guides welcome adult groups and lead them on guided tours of the outdoor gardens. Tours are usually one hour long and are usually scheduled on weekdays. Tour guides also lead Guided Garden Strolls, informal 45-minute tours that are free to the public on Sundays from June - September. Training is provided. Tour guides are expected to sign up for at least two tours each month from May through September. Many hands make light work. About 200 Olbrich volunteers help make Olbrich's Plant Sale with the Pros in early May a success. Volunteers help with greenhouse work, pot plants, set-up and take-down the sale area, check-in fellow volunteers, greet shoppers, assist shoppers with plant selection, work in the plant holding area, confirm prices and cashier, and load cars and direct traffic. Shifts vary - there's a job for everyone! 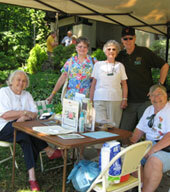 Volunteer greeters and garden guides welcome visitors at selected local gardens. The Olbrich Home Garden Tour in mid-July is popular with visitors because volunteers make it easy to learn about the creative ways homeowners have used plants to landscape their gardens. Welcome visitors before they enter the building, give Olbrich Botanical Society members their free tickets, sign-up new members, and give children free frozen custard coupons. Engage visitors at the learning stations in the lobby and at the hatcheries in the Conservatory. Volunteers rotate through the shifts, getting a chance to see every aspect of the education display. Training is provided. Welcome visitors as they enter the visitor center, and using a hand-held clicker, count all visitors as they enter. Welcome visitors at the entrance to the educational exhibit, take visitors' tickets and stamp their hands, sort and bundle tickets at the end of the shift. Provide a brief educational introduction to visitors as they enter the conservatory and promote a respectful enjoyment of the butterflies in their natural environment. Welcome visitors as they start the Butterfly Passport Walk in the outdoor gardens. Each December, Olbrich hosts about 20,000 visitors during Olbrich's Holiday Express - Flower and Model Train Show. Volunteers welcome visitors to this display of miniature trains chugging among beautiful flowers and holiday trees, help provide light refreshments for visitors, and welcome visitors as they enter the Bolz Conservatory. 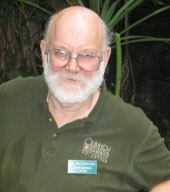 Throughout the year Olbrich hosts other events that usually only require 5 to 20 volunteers. These volunteers set up and assist at member preview parties, decorate for events, and provide advance help with Rhapsody in Bloom. On-call special event volunteer positions are perfect for those who need flexibility and don't mind behind-the-scenes work.